I hadn’t been to Lisbon before, and it was only after I’d arrived that I realised I was searching for Porto. I went to Porto in the summer of 2008, when I was living in London. I loved it – I arrived on a balmy night and the air smelled like leaves. For the three days I was there I was caught up in a wave of sensations – the smell of sausages sizzling down near the riverbank, the heat radiating off the pavement, the coolness of the port wine cellars, and the dizzyingly sweet taste of glass after glass of port. Some cities seem to have such a strong gravitational pull that it drags you into the life-force of the city. Porto was one of them. On this trip, Istanbul is probably the best example. In other cities you can see the potential, but you really need a local to show you around. And some cities never truly touch you. 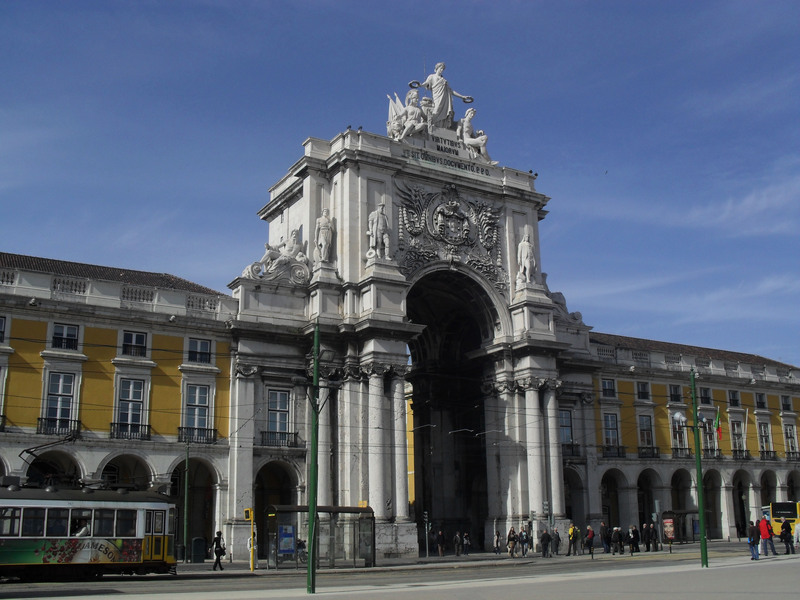 At first, Lisbon seemed to be in the second category. I spent my first two days enveloped in wet, grey clouds. Whenever I returned to my hostel in Baxia, the city looked so beautiful out the windows that I kept going out for walks, but without a destination I was overcome with a feeling of vague dissatisfaction – was I missing something? After a week of sun in Dahab (and the freckles to show for it) I had no patience for clouds. And after all of the smiles of Istanbul and Dahab, the people in Lisbon seemed grumpy and unsociable, and some of the men had pouts that could rival a parisienne. My third day, Tuesday, looked like it was going to be another grey day. I returned to Belém (having walked there in the rain on Monday only to discover that everything was closed) and, when I was on my way to Belém Tower, the sun came out! A man was playing a pan-flute by the river, where people leaned back on the benches by its banks. The smell of jasmine wafted over from the parks and I began to get a sense of Lisbon. 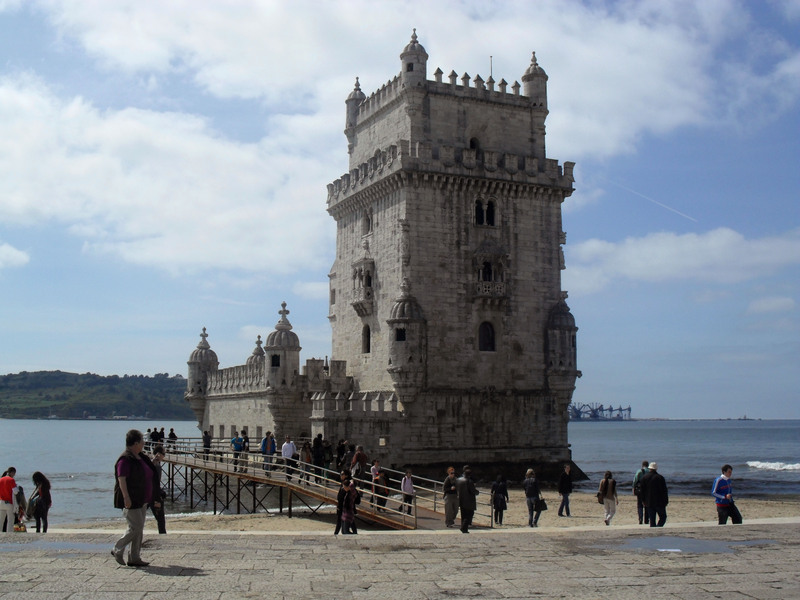 The three areas where I spent most of my time were Belém, Baxia and Alfama. In the sun, Belém was very peaceful, with beautiful manicured gardens near the river and pink, yellow and white buildings with terracotta roof tiles. The buildings there are some of the oldest in Lisbon, because the area didn’t suffer much damage in the 1775 earthquake. 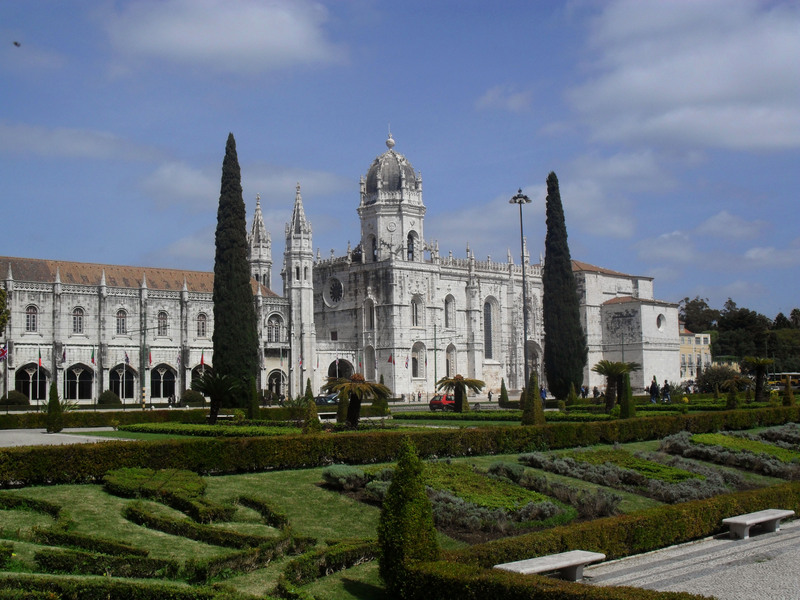 Sights in the area include Belém Tower, Jerónimos Monastery, Belém Palace, Ajuda Palace, The Monument to the Discoveries, the Botanical Gardens and the Coaches Museum. 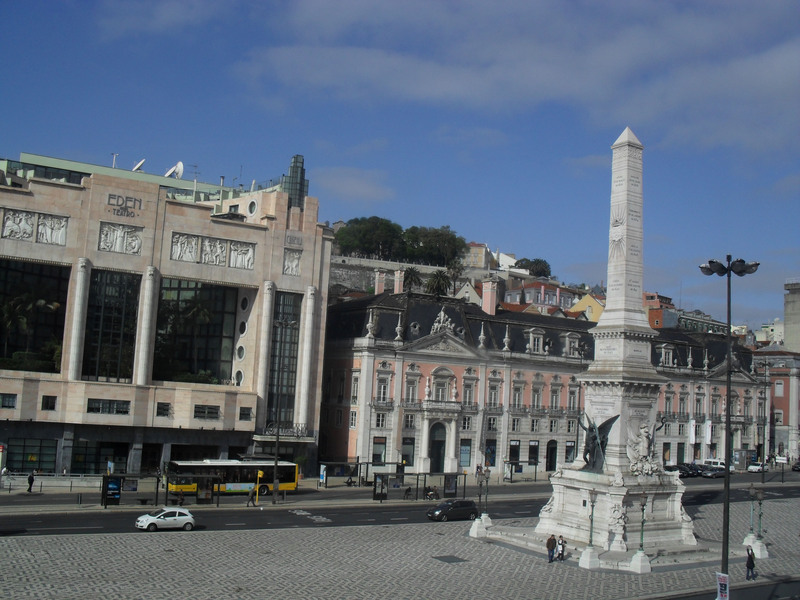 The next area was Baxia – where I was staying in Lisbon. 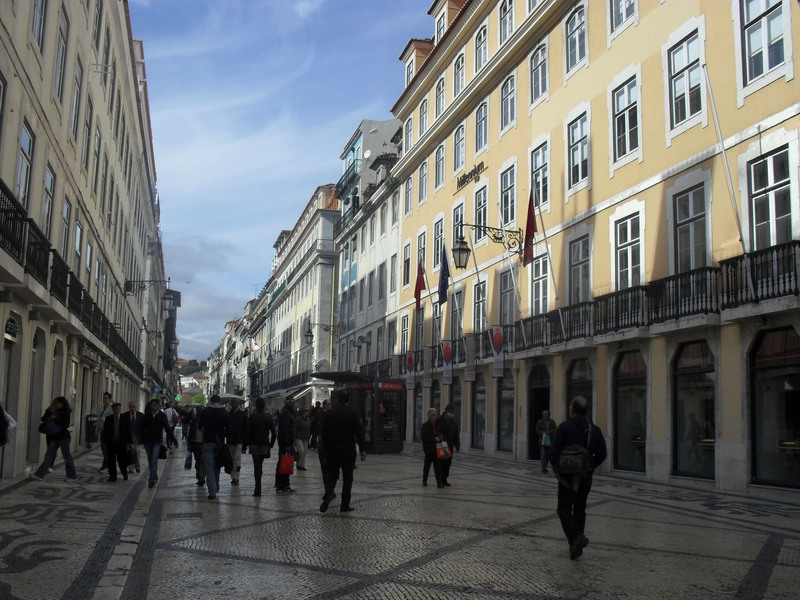 With white marble streets, large squares, expensive shops, and tourists with shopping bags, this is the main shopping and baking district of Lisbon. tall Santa Justa Elevator, designed by Raoul de Mesnier du Ponsard (an apprentice of Gustave Eiffel), from which you can see views of the city. Neighbouring Baxia is Alfama, a labyrinth of narrow streets with black paved roads paved and white footpaths. Home to Castelo de São Jorge and the National Tile Museum, steep stairs and winding streets lead up the hills to the castle, lined by churches and beautifully tiled or painted buildings with wrought-iron balconies. Blossomed trees are just starting to sprout green leaves, and when the wind picks the pavement is frosted in a shower of purple flowers. This area also survived the 1755 earthquake, and getting lost in the medieval maze is a pleasure. At the end of my last day I returned to Alfama to wander around, and stumbled upon a church. I popped inside to have a look, only to realise that I’d walked into a mass. The priest began to break the bread in preparation for communion, speaking in Portuguese. I was surprised to find the voice of Father Joe, the priest from my primary school parish in my head, reciting the English version – ‘. . . Christ broke the bread, gave it to his disciples and said: “Take this, all of you, and eat it: This is my body which will be given up for you” . . .’ The words must have been burned in my childhood and adolescent memories. Although I didn’t take communion, I stayed until the end of the mass. When I left my mind was still. And the sky had clouded over once more.